The KEY to Living Life Unstuck is Seeing Yourself As God See You! You are a one of a kind unique design! Life UnStuck demands that you live like it! The trouble is, as women we often find ourselves STUCK in a personalities and performance trap. We become more about what we do than who we are. We serve (Overflow) so many people in so many ways that as much as we love and value them, we often loose ourselves (Undertow) in the needs and demands of others. We become Un-Done; Un-Raveled and Un-Noticed rather than taking the time to look deeper into who we are and what God has in mind for living life and moving from STUCK to UNSTUCK. As we celebrate Day number two of this Life Unstuck BIRTHDAY WEEK, let’s take a few minutes together consider YOUR personality and all your WAYS. Lets stop and take a look at our particular personalities using a little tool I created called a “Garden of Personality”. This tool will help as we move along to uncover those STUCK places in your life and see how some of what we SEE as “Stuck”, God sees as POTENTIAL! This is your time! Remember, It’s ALL ABOUT YOU! Let’s have some fun with how God made us, shall we?!! Download your FREE Garden of Personality Quiz either in the Unstuck Woman Club or off the Life Unstuck website!! I want you to consciously choose to believe your WAYS are God’s PERFECT way for you and part of your life for a specific reason…and that reason is GOOD! Sure, you may have an over-abundance of quirky behaviors, but delight in them! God certainly delights in them, just as He delights in YOU! As you carefully consider just how beautifully and artistically created you are, I want you to also think about your passions. God gave you those, too, paired with your personality. And it is here, the joining of God-given passion and God-given personality, where your destiny, your calling, can be discovered and embraced. Sisters, you each were intricately made to make a difference in this world, and were created in the very way needed to make that God-given difference, that Plan, that Calling…YOUR calling, YOUR plan He has for you. Embrace your uniqueness. Relish in your quirks and wacky ways! Be you, and fully allow yourself to be you, for the world is dying to know hope and love…they are dying to be told by YOU, they are dying for you to BE you and tell them about Him. Be yourself…everyone else is taken! Be who God made you to be. Be God’s beautiful, treasured and cherished daughter. Please help me celebrate LIFE UNSTUCK , maybe win a FREE GIFT and talk about the ONE OF A KIND UNIQUE DESIGN God made you to be! CONGRATULATIONS To YESTERDAYS WINNER of a $25.00 Amazon Gift Card: Noelle Gore Ammerman!! Send me an email Noelle! Don’t Forget—Here are 4 ways you can win! 1-I will post here on the blog EVERY DAY FOR 5 DAYS! (That’s a FIRST!) Leave a comment and be entered. 2-Join my mailing list on the home page of my website–I ALWAYS bless my mailing list with Give-Aways! 3-Join me on my Page for Facebook Live all week 3/13-3/17 daily and leave a comment to be entered to win a prize. No worries if you can’t be there live, you can catch the replay! 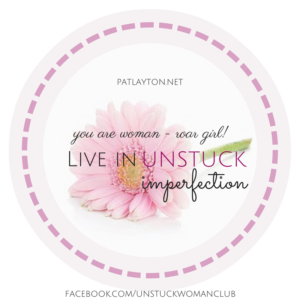 4-Join my private Facebook Group–The Unstuck Woman Club–for FREE DOWNLOADS! (Some are there now). Join the discussion and be entered again! Previous Post: « Let’s Have a Party and Give Some Stuff Away!! This is an awesome book and I still recommend it to many. Happy 2nd birthday! Thank you for the visit Laura!! Blessings! Thank you ladies!! I am grateful! Thanks to you, I’ve really fallen in love with Psalm 139! ME TOO! Thank you for the visit! I haven’t read Unstuck , but would like to do so. I really like reading the book of Psalm. Thanks for the wonderful giveaways. Thank you for the visit Julie B! !